As part of the London Design Festival 2018, the exhibition “Everything Happens So Much” opened at LCC from 15th September to 17th October. 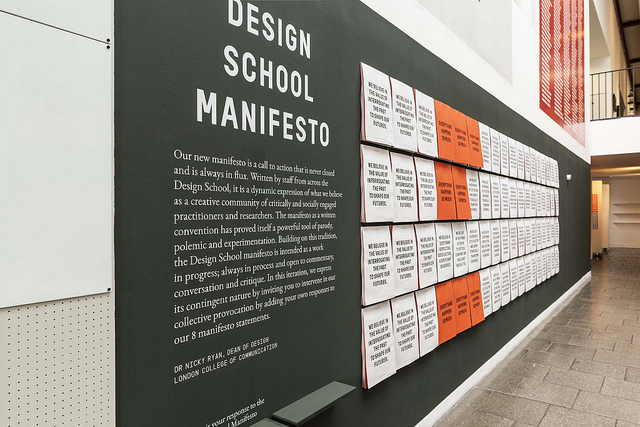 The exhibition celebrates the Design School of London College of Communication, and the launch of a new manifesto for the Design School, a call to action that is never closed and is always in flux. 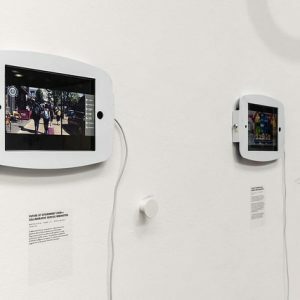 One of the galleries is dedicated to the work on service design that researchers, Phd Students and MA SEDI students have produced in the past year. It is a showcase and a celebration of the discipline, in all its diversity and nuances. This year marks a decade of service design research and teaching on the MA Service Experience Design and Innovation course. 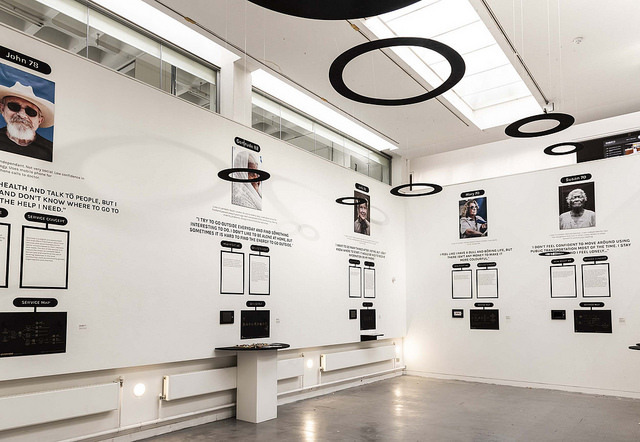 This exhibition shows how students and staff push the boundaries of service design to address challenges in a variety of contexts and at different scales. 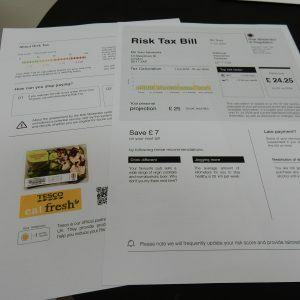 The projects exhibited span industries and time frames, dealing with pharmaceutical innovation and communication in Pharma Factory, local government adult social care provision in Lambeth, and government policy in the Future of Government 2030+ by addressing immediate needs and speculative future scenarios. 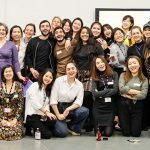 PARTICIPANTS – MA Service Experience Design and Innovation students and Hena Ali, Laura Blight, Cordula Friedlander, Silvia Grimaldi, Inbo Kang, Marion Lagedamont, Adriana (Nana) Maiolini. Irene Martin, Paola Pierri, Dr Alison Prendiville, Dr Lara Salinas, St George’s University of London. 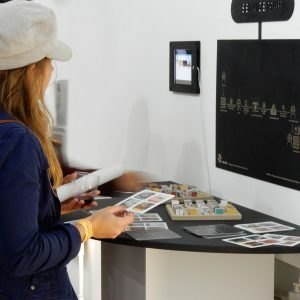 Curated by Silvia Grimaldi and Irene Martin, the Service Design exhibition showcases the work of PhD Students, Inbo Kang and Paola Pierri who presented their research posters. 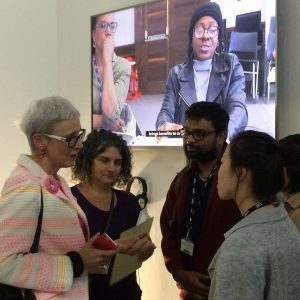 The work that MA SEDI students did with Lambeth Council and AGE UK Lambeth to develop an asset-based approach to engage with the older population of Lambeth is on display in the gallery, following on their project in the 2017-18 year. 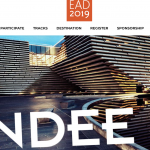 The work the MA SEDI Students did on the Future of Government 2030+ project a project commissioned by the EU JRC Policy Lab and carried out in parallel in six universities across Europe. 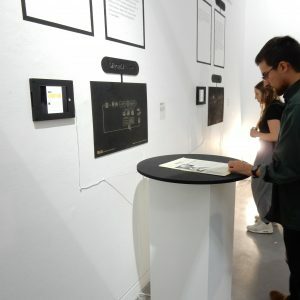 Very popular is also the exhibit of the Pharma Factory project, an EU H2020 project carried out at LCC, that three students took up as a Major Project. 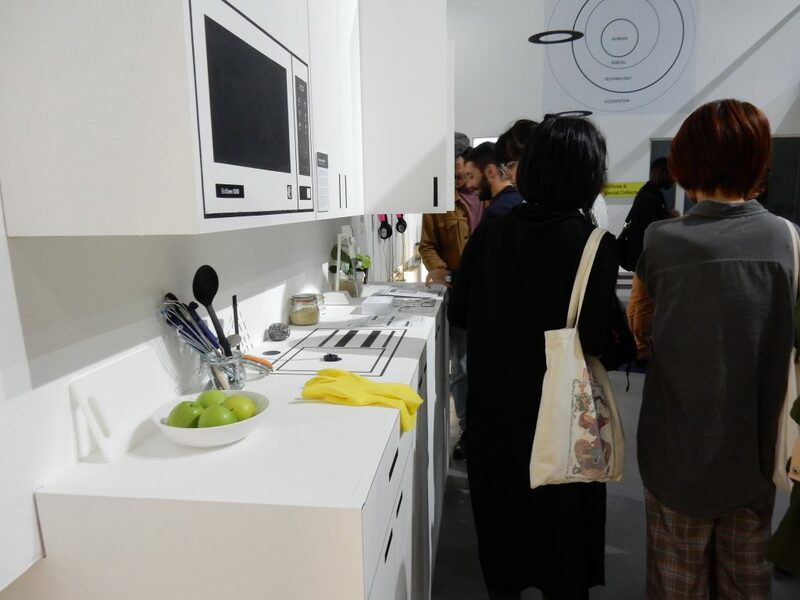 As part of their Major Project, Clara Llamas, Carlos Canali and Michael Sedbon (from MA IDC) collaborated on an installation to probe people’s reactions to the question: What if you could grow your own insulin at home? 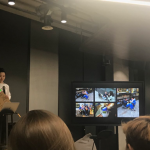 Sarah Weir OBE, CEO of the Design Council, who attended the opening night to present the Design Economy 2018 publication, was very impressed by the work showcased in the exhibition and stopped to talk to students about their project and plans for the future.